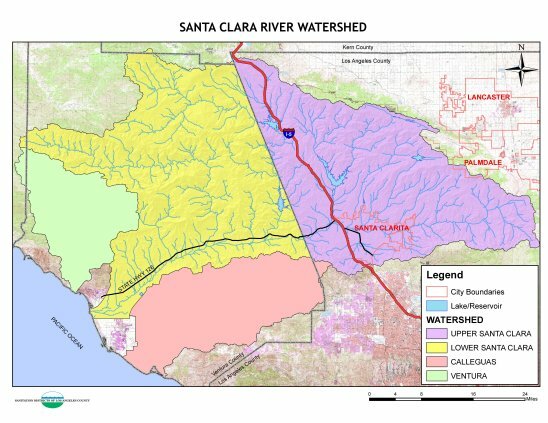 The Integrated Regional Water Management Plan (IRWMP) is a document that identifies and plans for the water resource-related needs of the Upper Santa Clara River Watershed. The IRWMP examines current and future water-related needs, identifies regional objectives for water-related resource management, develops strategies to address identified needs and then evaluates and offers various projects to meet the regional objectives. The purpose of the IRWMP is to integrate planning and implementation efforts and facilitate regional cooperation, with the goals of reducing water demands, improving operational efficiency, increasing water supply, improving water quality, and promoting resource stewardship over the long term. A collaborative stakeholder-driven process was used to develop the IRWMP. The IRWMP effort was funded entirely by local participating agencies. The Regional Water Management Group for the Upper Santa Clara River (USCR) Integrated Regional Water Management Plan (IRWM Plan) is required to amend its adopted 2014 IRWM Plan to meet the new standards provided in the Proposition 1 2016 IRWM Guidelines. Click here for guidance on how to read the Amendments. Comments must be received by 5:00 P.M. on April 6, 2018. Submit comments to Rick Viergutz at rviergutz@scvwa.org. 2014 IRWMP Update: The IRWMP was updated to conform to the Proposition 84 guidelines, which also included a climate change technical study. The 2014 Update of the IRWMP is now complete and you can view the documents by clicking here. Additionally, a salt/nutrient management plan was also prepared (see below for details). SNMP: The Regional Water Management Group for the IRWMP formed a cooperative to prepare a Salt Nutrient Management Plan (SNMP) for the Santa Clara River Valley East Ground Water Subbasin to comply with the State's Recycled Water Policy. The SNMP was prepared using guidance set forth by the Los Angeles Regional Water Quality Control Board and presents an evaluation of the salt and nutrients, and current and proposed water resource management practices in the Santa Clarita Valley. The document was adopted by the Los Angeles Regional Water Quality Control Board on December 8, 2016. On May 16, 2017, the State Water Resources Control Board approved the amendment and resolution to incorporate salt and nutrient measures into the Los Angeles Basin Plan. A copy of the SNMP and Appendices can be found here. For more information please contact Rick Viergutz at (661) 297-1600 Extension 281. Disadvantaged Community Involvement Program: The USCR RWMG is engaging with the Greater LA and Watershed's Coalition of Ventura County Regional Water Management Groups to prepare a Disadvantaged Community Involvement Program grant application. This group is known as the Disadvantaged Community Involvement Program Task Force (DACIP Task Force) and consists of members from the three IRWMs. The DACIP Task Force meets monthly. Participation by interested parties is highly encouraged. If you have any questions about USCR related efforts in the Disadvantaged Community Involvement Program grant application please contact the USCR DACIP Task Force members: Heather Merenda at the City of Santa Clarita or Rick Viergutz at Santa Clarita Valley Water Agency. Heather Merenda can be reached by email at: hmerenda@santa-clarita.com or by phone at (661) 284-1413, and Rick Viergutz can be reached by email at: rviergutz@scvwa.org or by phone at (661) 513-1281. More information about the activities can be found at the DACIP Website. The Santa Clara River is the largest river system in southern California that remains in a relatively natural state. The river originates in the northern slopes of the San Gabriel Mountains in north Los Angeles County, traverses in a westerly direction into Ventura County and discharges into the Pacific Ocean. The river runs approximately 100 miles from its headwater near Acton, California to its outlet, the ocean, and drains an area approximately 1,634 square miles. Approximately forty percent of the watershed is contained in Los Angeles County and 60 percent in Ventura County.